[CONT](VC):During your turn, this unit gets [Power]+2000 for each of your rear-guards. 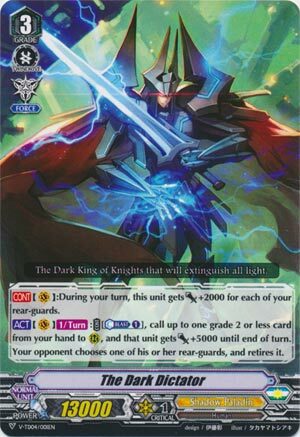 [ACT](VC)[1/Turn]:COST [Counter Blast (1)], call up to one grade 2 or less card from your hand to (RC), and that unit gets [Power]+5000 until end of turn. Your opponent chooses one of his or her rear-guards, and retires it. So he gets 10k with a full board no matter what whereas the King of Knights only gets 10k when paired with Blaster Blade. Who’s the real king here I wonder? Anyway, the power gain is basically just there to ensure hits Mid Game while eating at Perfect Guard-less hands Late Game. The main draw is the fact that this can retire one of the opponent’s cards every turn as long as damage is open. In all honestly that alone isn’t all that amazing. You’re spending every turn using up resources for low quality advantage. The 5k extra power to a called unit is a draw, sure, but for similar decks I’d rather pay CB1 for a higher-quality card and skip the power. His only saving grace will be Charon, once October the 29th hits, who can Countercharge. Even then you could always build a deck without this and go super ham with Phantom Blaster Dragon and Badhabh Caar.